Logic Pro X 10.2.3 includes the following changes. Crossfades between comp sections in Take Folders can now be graphically edited. The following plug-ins have been redesigned with Retina ready interfaces: Exciter, Echo, Modulation Delay, Noise Gate, Pitch Shifter, Match EQ, Match EQ Surround, Surround Multimeter. New Loudness Meter plug-in provides support for LUFS metering. The Modulation Delay plug-in now includes a Feedback Filter. The Chorus and Modulation Delay plug-ins now each offer a D-mode button. The Noise Gate now includes a ducker. The Noise Gate plug-in now offers a filter characteristics menu which may be set to either Band Pass or Band Reject. There are now independent ‘Hold’ buttons for the Analyzer, Goniometer and Level Meter sections of the Multimeter plug-in. There’s a limitation, in place right now, regarding saving patches and including the aux and bus routings. Logic’s own default patches have this functionality but the end user is restricted in this area. One workaround is to pack everything into a summing Track Stack but this is not always so elegant and includes unnecessary routings. Create an audio or software instrument channel strip and create one or many bus routings to use with your favorite effects. Create tracks for the aux channel strips and make a summing stack of them. The easiest way to do this is to select the tracks you want to bundle then from the mixers’s local menu choose Create Track Stack for Selected Channel Strips or assign your own key command. A small drop-down window appears asking you to select the kind of stack you want. Choose Summing Stack. I get many questions on how to move Logic’s Apple Loops and samples to an alternative location like i.e. to a secondary internal or external drive. 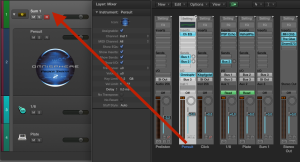 There’s widespread information about using aliases when linking back to Logic Pro X’s default locations. Unfortunately this is a very risky assumption because every update related to that content will overwrite the alias and recreate an ordinary folder instead. The problem is that your other content will be orphaned and you will end up with library content that needs to be redownloaded again. 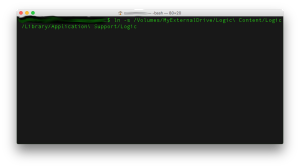 The correct way of do this is to use symbolic links.